BRISTOL, Conn., April 15, 2012 – The “3 to See” did not stay on the board for long. The Phoenix Mercury selected Baylor’s Brittney Griner with the No. 1 overall pick of the 2013 WNBA Draft presented by State Farm. The Chicago Sky tapped Elena Delle Donne of Delaware with the second overall selection, and the Tulsa Shock picked Notre Dame’s Skylar Diggins at No. 3. A 6-8 center, Griner was a dominant presence at Baylor, finishing her collegiate career ranked first all time in Women’s NCAA Division 1 history in blocks (748) and dunks (18), and second in points (3,283) and double-figure scoring games (146 of 148). Her blocks total actually paces both women and men – topping the 564 of Mississippi State’s Jarvis Varnado — while her 18 dunks account for 54.5 percent of the 33 total dunks by college women. A 6-5 guard/forward, Delle Donne led the nation in scoring as a junior, finished second as a senior and completed her college career as the fifth-leading scorer in NCAA history (3,039). Diggins, a four-time All-America, finished her career as Notre Dame’s career leader in points and steals, ranks second in assists. The 5-9 guard joins the Shock already established as a social media celebrity, with over 300,000 followers on Twitter (@SkyDigg4). 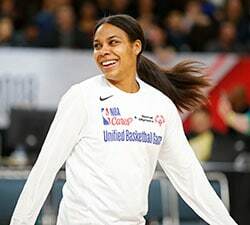 With the fifth overall pick, the Washington Mystics selected Ohio State’s Tyler Hill, a 5-10 guard and defensive stalwart, who averaged 20-plus points in both her junior and senior years. The New York Liberty, the lone team with multiple picks in the first round, picked Texas A&M’s Kelsey Bone, a 6-4 center, with the fifth overall selection and Oklahoma State’s Toni Young, a 6-2 forward, at No. 7. Bone earned All-SEC First Team honors while Young was a unanimous All-Big 12 pick sandwiched between the Liberty’s two picks, the Seattle Storm used the sixth overall selection on Maryland’s Tianna Hawkins, a 6-3 forward and an All-ACC First Team pick after leading the league in scoring.. The San Antonio Silver Stars selected 6-4 center Kayla Alexander from Syracuse with the eighth pick of the first round; Alexander is the only player in school history to top 2,000 points (2,024). The Indiana Fever used the ninth selection on Cal’s Layshia Clarendon, a 5-9 guard who earned All-Pac-12 First Team honors as a senior. 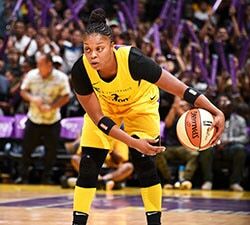 With the 10th pick, the Los Angeles Sparks tapped Kentucky’s A’dia Matthies, a 5-9 guard and the first Wildcats’ player (male or female) to post 1,900 points, 600 rebounds, 300 assists, 300 steals in a career. The Connecticut Sun selected UConn’s Kelly Faris, a 5-11 guard and All-BIG EAST Defensive Player of the Year, with the 11th overall pick. 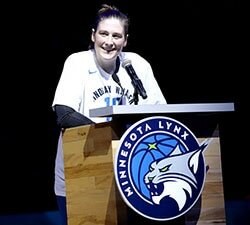 With the 12th and final pick of the first round, the Minnesota Lynx took Nebraska’s 5-9 guard Lindsey Moore and two-time finalist for the Nancy Lieberman Award (given to the nation’s top Div. I point guard). The first round draft order follows.